As soon as I had finished reading The Island of Terror, the Professor Challenger novella written by William Meikle and published by Dark Regions Press, I immediately went onto my Kindle and downloaded a copy of Professor Challenger: The Kew Growths and Other Stories, the follow-up Challenger anthology that Mr Meikle penned a few years after the novella, and which is also published by Dark Regions Press. I actually downloaded it at around 11:30 at night – I was bone-tired from work and looking after two young children, but as I mentioned in my review of The Island of Terror, something about the author’s portrayal of Challenger and his fellow adventurers had ‘clicked’ with me in a way that characters hadn’t for a long time. I started reading as soon as it was on my Kindle, and I’m fairly certain it was well after midnight when I finally went to sleep, reluctantly closing the anthology because I couldn’t keep my eyes open any longer. I picked it up again as soon as I possibly could, during my lunch break, and finally finished it that night. Although I’m quite a fast reader, I usually take my time with books, if only because I have relatively little time to read each day, but with this collection I spent every spare minute I had devoted to it. So, I suppose you could say that I liked it. A lot, even. But I know that just being effusive about this isn’t going to persuade your average reader of my reviews to purchase this book immediately – even though they absolutely should – so let’s take a look at it in some more detail. As with most of Mr Meikle’s works published by Dark Regions Press, The Kew Growths and Other Stories has cover art and interior illustrations by M. Wayne Miller, and they’re amazing as usual; I’ve never seen a bad piece of art from Mr Miller, and each one is always atmospheric and evocative of whichever particular scene they’re illustrating. 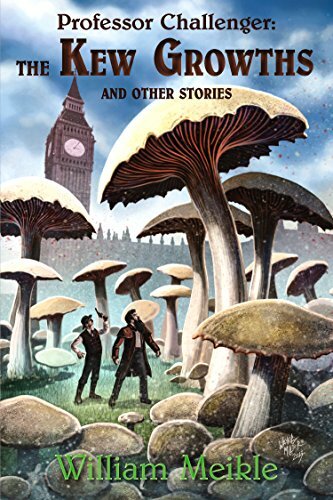 The cover art is particularly striking, with Professor Challenger and his reporter comrade Malone dwarfed by a series of huge mushrooms – the titular Kew Growths – that have suddenly erupted all around London, Big Ben and Parliament looming in the background. The detail is fantastic, with Miller even bringing out the individual spores on the mushrooms that are central to the death and destruction that the growths visit on London. It should also be noted that the copy-editing is also top-notch, with no typos, name substitutions or other errors being noticed throughout the title. Turning to the written content of the collection, it consists of thirteen short stories, the majority of which are original and have not been published before. The chronology varies slightly, but most take place in and around the Edwardian period just prior to the First World War, with a few of the stories set in the aftermath of that conflict. The tales themselves are of a uniformly brilliant quality, well-written and usually very fast-paced as Challenger and Malone race around looking for a mysterious creature or object, and the author has imbued them with a real sense of energy. Challenger is an interesting character – highly intelligent and knowledgeable, but this is coupled with a palpable sense of energy and impetuousness, along with a hair-trigger temper that is deployed at the slightest opportunity and often only defused by Malone’s ability to defuse or divert the Professor into some other conversation or insight. Mr Meikle obviously has an innate understand of Challenger, because all of the stories are dominated by the character, and in many of the tales it often seems like you’re being physically pulled along in his wake. It’s often exhilarating, and coupled with some muscular and deftly-written prose, it’s all too easy to imagine yourself climbing up a Scottish mountain, or hurtling through the depths of a hidden jungle valley alongside Challenger and Malone. The stories all exhibit Mr Meikle’s use of varied locations and climates, with stories taking place throughout the United Kingdom, and also diverting on occasion to foreign climes, including the state of Montana. The opening tale, The Kew Growths, has Challenger and Malone dealing with an outbreak of mushroom-style plants that are being exhibited at Kew Gardens, and demonstrate an unusual aural property. At first it seems like an early intervention by Carnacki the Ghost-Finder is enough to neutralise the occult growths, but a sudden twist shows it’s too late: the growths soon spread throughout London and threaten to engulf the entire country. It’s a spectacular opening, especially as the author rapidly escalates the danger caused by the growths; by the end of the story, much of London is either in flames or devastated by riots and the plants themselves, including a gutted Buckingham Palace, and the population dissolved by the growths. And while eventually the growths are defeated by Challenger, Malone and Carnacki, I was pleasantly surprised to see the results of the story referenced in other tales; instead of being self-contained, almost parallel-universe tales as these collections often are, there is a shared universe that provides a great deal of continuity. There’s almost an undercurrent of glee detectable from Mr Meikle in some of the stories, as he inflicts more woes on London – in Parting the Veil an experiment by John Logie Baird accidentally unleashes the living dead, and Ice sees another Logie Baird experiment (why he wasn’t in the Tower of London at this point is an interesting point for the reader to debate) cover the capital city in sheet ice. The Challenger canon does lend itself well to such dire circumstances, and I can well see why the author might have wanted to employ some wholesale destruction given the majority of his stories are tight, taut, atmospheric affairs featuring a small cast of characters. Not all of the stories, however, feature such wide-ranging affairs, and many of them are very self-contained, personal stories, often with Challenger and Malone acting as bystanders or witnesses to some tragic tale. The Monster of the Ness, in which Challenger heads to Loch Ness to seek out Nessie, is a genuinely heart-breaking tale as the duo find the famed creature, only to discover the reason why it returns to the Loch; and The Auld Grey Man has Challenger hunting a Yeti-style creature haunting a Scottish mountain and revealing its tragic fate. There are also a couple of stories that hint at wider consequences for Challenger and his colleagues and their world, particularly in The Penge Terror, which sees the Professor reluctantly assisting the military in dealing with a visitor from another world with an unsettling and open-ended finale. As with Carnacki the Ghost-Finder, the author appears to have successfully co-opted Professor Challenger, displaying an instinctive understanding of the character, canon and themes that has led him to create his own, superior version of Conan Doyle’s original creation. Throughout the stories we get to see Challenger’s background slowly fleshed out, and he becomes more than a two-dimensional, Brian Blessed-esque character; in particular, the illness of his wife, and her eventual death, deeply affect him and, in turn, the stories in the latter half of the anthology. Professor Challenger: The Kew Growths and Other Stories is another fantastic collection of short stories from William Meikle, and serves as excellent demonstration of his inherent skill as a writer, breathing fresh life into an obscure classic character and reinvigorating him for the 21st Century.